« Christmas Carols at the Old Orchard Christmas Craft Fair. Rathfarnham. 7 – 9.30pm. 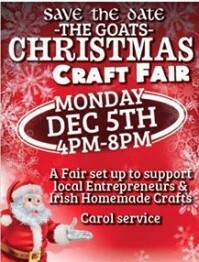 Christmas Carols at the Goat Christmas Craft Fair. Goatstown. 7 – 8.30pm.